Written by Christina Khawa in Ambience Data, Products, Smart Cities. The Internet of Things, also known as IoT, can be defined as "the network of physical objects that contain embedded technology to communicate and sense or interact with their internal states or the external environment. "1 In simpler terms, it is the ability to connect devices to one another, to applications, or to us through the internet. IoT has been discussed for decades now, but we are only now seeing its impact in every type of industry. With this in mind, Ambience IoT created a real-time monitoring device called The Sparrow. Its versatility to integrate with different types of hardware to connect with different databases, including our own, makes it a valuable product in today's environmental industry. The environmental data that is collected can be viewed on any web-enabled device, whether you are located on or off-site. The Sparrow uses WiFi or GSM to communicate this data from the sensors located in its 5 plug and play ready sensor bays. Smart cities, vineyards, crop fields, and microclimates are a few of the many industries The Sparrow can be used in. A microclimate is a smaller area within a general climate zone that has its own unique climate.2 For instance, the city of Toronto can have a multitude of microclimates within the region. This can be observed on a hot day when you're driving down an asphalt street in the middle of the city, only to find the temperature lower once you reach the outskirts of town where there are less buildings, less asphalt, and less vehicles. It is important, when monitoring, to distinguish between climate/large regional data to these microclimates because of potentially significant data differences between the two areas. Factors such as topography, soil composition, and surface water can affect microclimate data. 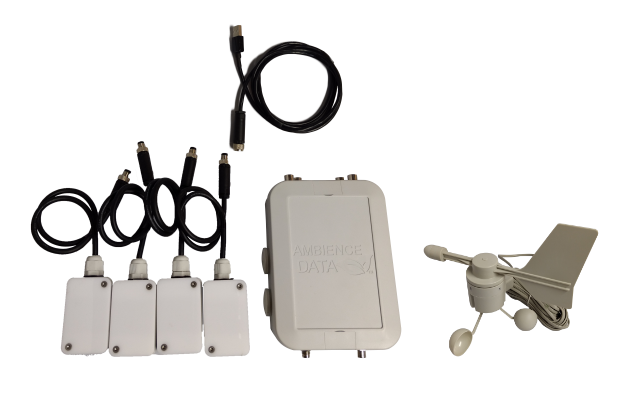 With this in mind, Ambience IoT created a Microclimate bundle so you can acquire data quickly, easily, and accurately. The package includes a rain gauge, wind direction/speed module, a temperature/humidity/pressure sensor, and The Sparrow. Our devices give accurate microclimate data whether it is used for your city, greenhouse, or garden.